2 "A problem from Hell"
Samantha Power (born September 21, 1970, in Dungarvan, County Waterford in Ireland) married Cass Sunstein in 2008. In January 2009 President Obama appointed Samantha Power to the National Security Council, as director for multilateral affairs. Since she began her career working as a war correspondent in Bosnia at the tender age of 22, Power has believed that nations have a moral obligation to prevent genocide. She can bring life to these ideals from her position of the National Security Council. "Let me give you a thought experiment here, and it is the following: without addressing the Palestine – Israel problem, let’s say you were an advisor to the President of the United States, how would you respond to current events there? Would you advise him to put a structure in place to monitor that situation, at least if one party or another [starts] looking like they might be moving toward genocide?" The above views she expressed in 2002, she now has an opportunity to implement, as an adviser to President Barack Obama in her capacity as director for multilateral affairs on the National Security Council. Power won a Pulitzer Prize for her 2002 book on genocide, entitled “A Problem from Hell,” which examined the U.S. foreign policy response to genocide. The book argues that the Armenia, Nazi Germany, Cambodia and Rwanda genocides occurred because of government authorities averted their eyes and individuals made the choice not to intervene. Tom Hayden wrote an article for The Rag Blog March 30 2011 on Samantha Power, "Obama's 'humanitarian hawk': Samantha Power goes to war". Power has made a remarkable career recovery since calling Hillary Clinton a “monster” during the 2008 presidential primaries. She resigned from the Obama campaign after that comment, but has returned to become a special assistant to the president and member of his National Security Council. Over a long conversation with Power in December 2003, I was struck by the generational factor in her thinking. If she had experienced Vietnam in her early twenties, I felt, she would have joined the radical left, suspicious always of American power. But as an Irish internationalist witnessing death and destruction in the former Yugoslavia, she wondered how the United States could be neutral. She strongly favored the American intervention and air war that followed. I asked whether she would have favored the Clinton administration sending combat troops to battle the Serbs, a scenario which was in the works when Russia pulled its support from Belgrade, effectively ending that war. I didn’t get an answer, only the promise of “a long conversation” in the future. Power generalized from her Balkans experience to become an advocate of American and NATO military intervention in humanitarian crises, a position which became known as being a “humanitarian hawk.” She began to see war as an instrument for achieving her liberal, even radical, values. “The United States must also be prepared to risk the lives of its soldiers” to stop the threat of genocide, she wrote. She condemned Western “appeasement” of dictators. She believed that “the battle to stop genocide has been repeatedly lost in the realm of domestic politics.” In her mind, domestic concerns like discrimination and unemployment are secondary to foreign policy crises, a common attitude in the national security circles she was entering. 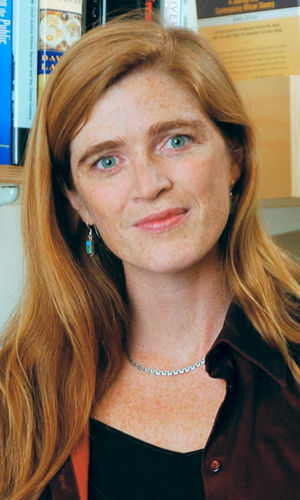 Samantha Power signed an April 2003 Statement on Cuba, initiated and circulated by prominent Democratic Socialists of America (DSA) member Leo Casey, calling for the lifting of trade sanctions against Cuba. “a statement circulating among democratic left/socialist folks, largely by members of Democratic Socialists of America, condemning the recent trials and convictions of non-violent dissenters in Cuba”. The democratic left worldwide has opposed the U.S. embargo on Cuba as counterproductive, more harmful to the interests of the Cuban people than helpful to political democratization. The Cuban state's current repression of political dissidents amounts to collaboration with the most reactionary elements of the U.S. administration in their efforts to maintain sanctions and to institute even more punitive measures against Cuba. Many of the petition's 120 odd signatories were known members of DSA. Power generalized from her Balkans experience to become an advocate of American and NATO military intervention in humanitarian crises, a position which became known as being a “humanitarian hawk.” She began to see war as an instrument to achieving her liberal, even radical, values. “The United States must also be prepared to risk the lives of its soldiers” to stop the threat of genocide, she wrote. She condemned Western “appeasement” of dictators. She believed that "the battle to stop genocide has been repeatedly lost in the realm of domestic politics." Barack Obama initially headhunted Power in 2005, after reading her book. After a long meeting, Power decided to take leave from her Harvard professorship to work for the then senator. Following her work for Gen. Wesley Clark's 2004 presidential campaign, Power volunteered in the Washington office of a new U.S. Senator, Barack Obama. According to her account, she bonded with Obama in a three-hour policy conversation, worked in Obama’s office in 2005-6, and became a close collaborator. As Obama wrote in The Audacity of Hope, "Samantha Power deserves special mention for her extraordinary generosity; despite being in the middle of writing her own book, she combed over each chapter as if it were hers, providing me with a steady flow of useful comments even as she cheered me up whenever my spirits or energy were flagging." After the 2008 presidential election, Power returned to Obama's team, becoming a member of the transition team, working for the Department of State. In January 2009 President Obama appointed Samantha Power to the National Security Council, as director for multilateral affairs. Power was a speaker for a Netroots Nation convention. In January 2009, Richard Cooper and Juliette Voïnov Kohler edited a book entitled "Responsibility to Protect: The Global Moral Compact for the 21st Century". The foreword for the book was written by Samantha Power, who that same month was appointed to the National Security Council, as director for multilateral affairs by President Barack Obama.. Cooper has served on the Board of Directors of the Chicago Center for US/USSR Relations and Exchanges and currently heads up the organization Responsibility to Protect. This page was last modified on 11 July 2015, at 00:38.